Microsoft UK has a Chief Envisioning Officer (Dave Coplin) whose job it is to ‘reimagine’ business from a technology perspective. In his book ‘Business Reimagined’ (1), he looks at a future working environment based on collaborative and flexible working and on technology that, used correctly, liberates rather than constrains. Although Microsoft is a ‘born digital’ company, part of its fabric (like many other technology organisations) is to continually reinvent itself to stay current. The company recently announced a further evolution of its business to update not just the organisational structure but its underlying culture too. Because of the pace of continual change, people who can bring in new thinking or can stimulate it are highly valued. So too are teams within the organisation that create a new way forward in addition to reacting and responding to internal and external developments. Many of these teams are multi-generational and increasingly ‘self-managed’ – as too much happens too quickly to be overly managed in the traditional sense. So how do we ensure that these new teams, that need more freedom to operate, are productive and contribute to the growth of the organisation? Managers are often concerned about how to engage and harness Generation Y’s creative power, fearing that they are somehow different and not controllable. With all this freedom, is there a risk that the workplace becomes more like a playground with teams adding no real value to the business? Just how different are Generation Y’s needs to those of the rest of us from a collaborative and team perspective? Barrett Values research conducted by Hannah Lee (2) suggests that personal and work values held across the generations may not be as different as we think. Teamwork, Work-life Balance and Learning Opportunities being at least three of the values that are shared across the generations. So rather than focusing on generational differences, Lee suggests focusing on these ‘generational linkages’. Certainly this is borne out at Microsoft, where a blend of experience and knowledge transfers occurs across the generations. The company has a broad age demographic and is certainly not just made up purely of ‘the 20 somethings’. The age range is diverse and quite evenly spread. So how can we create the right environment that provides teams with an appropriate level of freedom to deliver the corporate objectives and grow the business? To answer this, OE Cam, along with our European consulting partners in ACE (3) is currently conducting a piece of research into Autonomous Teams. 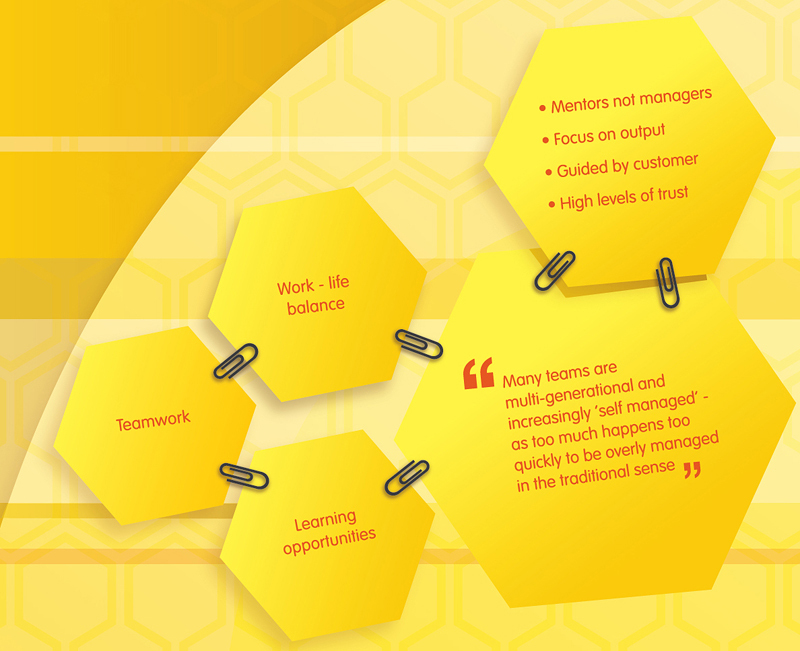 From our research so far, some of the themes emerging are around mentoring rather than managing, focusing on output, being guided by the customer, and building up a high level of trust between team members. Hannah Lee’s values research states that coaching and mentoring is a core value shared across the generations. One of the young interns we spoke to in our research explained that his manager acts as a coach/mentor but does not specifically tell him how to do things. This also meets the ‘freedom’ value. He felt that being guided and enabled to think for himself was the main reason he was learning so quickly. He is a technology specialist and his manager has a different skill set so is unable to specifically tell him how to do his job. But his manager is highly creative and knowledgeable about the business so can guide the bigger picture and give him a vision. Once he knows what he needs to achieve, he’s left alone to get there. Their working relationship suits them both well. If he needs help, he is trusted to ask. If he doesn’t deliver, he is then more closely managed so he learns another way to do something. This may involve needing to network and discover others with different skills and collaborating outside his workgroup. If the workload seems too much, other team members will then come in to help (or indeed those he newly collaborates with). He explained that his role is highly visible so it’s also this level of visibility that encourages him to deliver high quality, timely, outputs. He explained that due to the trust the team has in him, he feels particularly responsible and accountable for meeting his objectives and therefore he focuses more. Rather than being heavily managed or having a strong hierarchy, a common environmental condition to enable self-managed teams to thrive anywhere is that organisations are more democratised with a high degree of collaboration. And they focus on what the output needs to be, rather than the process of getting there or the number of hours worked per day. The overall objectives are made very clear by the leadership allowing teams to work with each other to produce a framework of how to reach them. Between them a joint way forward is agreed. Timeframes must be met but how team members get there and meet deadlines is up to them. As many self-managed teams are virtual (brought together to deliver a single project for example) and may be globally dispersed, it is not possible for everyone to sit together in the same office. However, roles and responsibilities are made clear, as is the ultimate goal to be reached. We are also finding that team members need to understand not just their own market but be prepared to flex to customer requirements that can shift rapidly. Particularly in fast moving markets, being guided by the customer and having the agility to act are essential. The customer is seen as the team’s guide rather than the manager, ensuring priorities are changed and work rearranged to deliver for the external customer, rather than the internal hierarchy. For the people we spoke to, autonomous working is most successful when there is a high level of trust. This is also reflected in Coplin’s writing. Trust is built up in a number of ways. Within self-managed teams it appears to stem from the relationships that are built up and the level of commitment people have regardless of their age group. Within the team it’s getting to know people, observing their track record of delivering what they say they’re going to deliver, their ability to communicate what they’re delivering and knowing from past experience that they are reliable in terms of follow-through. Their output matches or exceeds expectations. If this is consistent, trust is built up and team bonds become stronger. A greater understanding of team strengths and weaknesses is built up and greater willingness to rely on others occurs as a consequence. Within Microsoft, to support this behaviour, the performance management process rewards individuals not just for achieving their own commitments but for collaborating with others and building on others’ ideas/best practices. Another aspect of trust emerging with the rise of social media is openly sharing information rather than data hoarding. Culturally speaking, sharing data is commonplace within self-managed teams and underpins collaboration. Rather than being frightened by an enormous pool of unwieldy and often subjective data, finding more intelligent ways to work with it and respond enables agility in staying ahead. But doing this may depend on trusting employees to become ever more self-managed because of the immediacy and visibility some decisions require. As Mark Brown suggests in his article, a “new world is emerging and you need to spot it early to stay alive – or if you want to be really ‘can-do’, you create this new order”. If you believe that your marketplace is becoming more dynamic and complex, then there will be a growing need to allow teams within your business become more autonomous. The emerging themes discussed above can help guide teams to work with ‘lighter’ management than has hitherto been required. But we are also aware that leaders can be concerned about losing control and be resistant to providing that degree of freedom. So to move in the right direction, the context of the existing management culture, combined with the market challenges needs to inform us on how to develop an appropriate level of autonomy within teams. For more traditional firms, this can mean allowing teams to earn their right for more freedom… one step at a time. OE Cam’s international research is ongoing with results due in autumn 2014. If you would like to contribute or hear more about the results, please do contact Gary or Susan on (0)1223 269009 or by email.